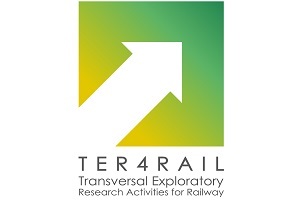 The main objective of TER4RAIL is to reinforce the cooperation between rail-related stakeholders to improve the efficiency of the consensual exploratory research in the rail sector, in order to facilitate emerging innovative ideas and the cross-fertilisation of knowledge from other disciplines or of disruptive technology and innovation. TER4RAIL intends to promote this process by strengthening transversal exploratory research in Europe for and with a railways perspective in the frame of multimodality. To support this aim, cooperation with the ERRAC European Technology Platform (ETP) is extremely important. For this reason, the participants of the Consortium form the central stakeholders of ERRAC and are deeply engaged in ERRAC activities. To communicate and promote, in joint collaboration with Shift2Rail, the outcomes of the CSA to the scientific community, rail stakeholders, mobility innovators, technology providers, policy makers, and non-rail stakeholders in the framework of coordinated transversal Research and Innovation (R&I).